In November 2016, my travels took me to a stunning corner of the world to witness and become part of an elephant conservation project. 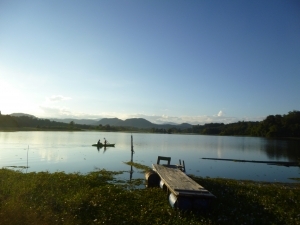 Located on the edge of a lake in the Sayaboury province in Laos, the conservation project was surrounded by verdant jungle and cloud-clad mountains. We took a boat over the lake to the centre, marvelling at the reflections of the mountains in the water. This had to be the most stunning location of a volunteer project that I have ever seen – I have seen a few! The project is home to 7 resident elephants, but other elephants come here to receive hospital treatment and receive specialist care during pregnancy. Volunteers have little to do with the “visiting” elephants, instead focussing attention on the resident herd. These elephants come from terrible backgrounds, mainly forced to work in the logging industry, dragging several tons of timber up and down mountains day in and day out. Several of them have sustained injuries, although for most of them it is the mental scars that haunt them. One of them was shot at when grazing where she shouldn’t be, causing her to miscarry; another one had lived on her own for so many years, that she has forgotten what it is like to be around other elephants. This project aims to rehabilitate these elephants, and offer them a life as close to the wild as possible, whilst also aiming to conserve the larger elephant population in Laos as a whole. Stepping off the boat at the centre was like entering another world. We were soon lucky enough to see the elephants, happily frolicking in a designated swimming area at the edge of the lake. I have never seen elephants swim before – the baby of the group was trying hard to swim too, and it was an amazing site. After the elephants had finished cooling down in the water, we were introduced to each of them individually and learned their stories. We gave them a few treats to eat, before they headed off back into the jungle where they would sleep out in the wild, as close to their natural patterns as possible. We would meet them again tomorrow. In addition to meeting the elephants, my first day at this project involved learning a great deal. We visited the on-site museum, where we learned more about the history of elephants in Laos, and then went on to the elephant hospital, where we learned about all of the care that is required for these rescued creatures. As the light began to fade I headed down to a small jetty overlooking the lake’s edge. The sun was beginning to set behind the mountains, covering both the sky and the lake in a stunning orange glow. I watched as it disappeared behind them, marvelling at the peace and tranquility of this elephant haven. In the evening, we settled down to a fine dinner of rice, stir fry, vegetable dishes and fruit to discuss all that we had experienced that day. Contented, I fell asleep as soon as the light went off, ready to experience the coming day. 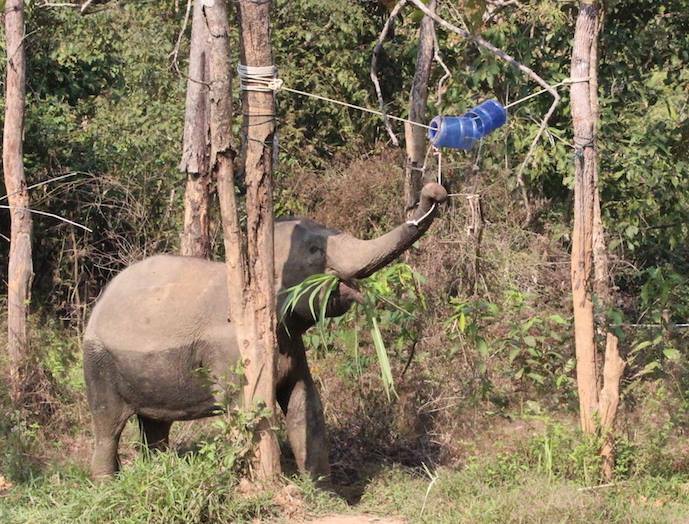 To find out more about elephant conservation in Laos, see our elephant volunteering web page. 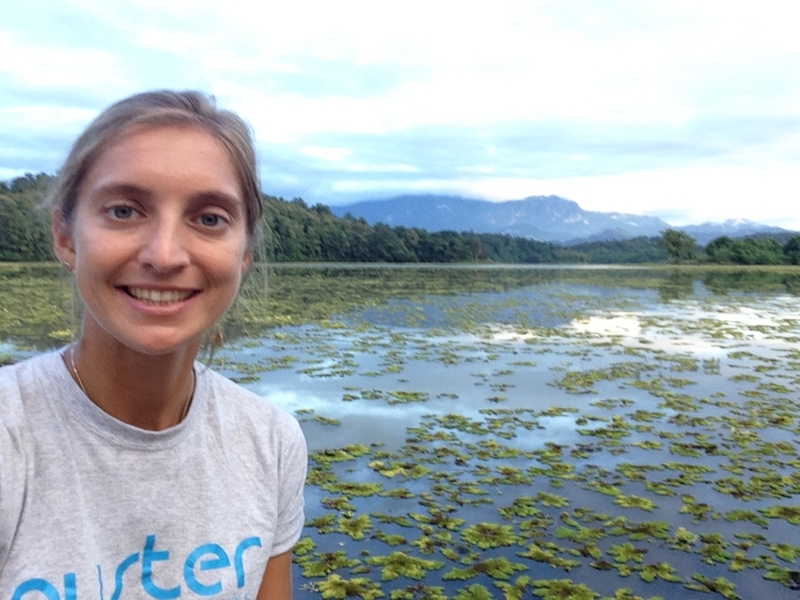 Previous Post Congratulations to all the Oyster Volunteers who took part in our Australia and New Zealand conservation programmes this year!